James Atherton has been part of the strategic consulting team at Blue Latitude Health since 2010, and now heads up our New York office as Vice President and Managing Consultant. He’s in a unique position to talk about how having a creative services capability has changed the way we’re able to deliver strategic work for clients, and how our NYC and London offices work together as a full service global team. Blue Latitude Health started out as a strategic marketing consultancy, delivering strategic plans and tactical recommendations to our clients, which would then result in organisational changes or be picked up and delivered by a creative partner. In 2012, we were a pure-play business and marketing consultancy. Fast-forward to 2016, and we had both EMEA and global agency of record accounts across three therapy areas. Blue Latitude Health has seen some huge changes to the service offering since you started back in 2010. How has this impacted both the business and what we can offer our clients? We developed the creative services capability with a blank canvas, and what we were able to do was design our processes to ensure our creative teams were integrated with strategy, instead of working in silos. It wasn’t something we saw other companies doing back in 2013, and it allowed us to grow into a truly collaborative team – with creative getting involved at the very start of proposals and projects, alongside strategy and customer experience (CX). Creative is also now brought in as a dedicated resource on our larger projects and accounts. This means that our project teams are balanced, bringing together a true mix of skillsets to deliver strategically and creatively integrated work for clients. When we first started talking about a creative services capability, I’ll admit that I didn’t know that much about the practical implications for the business.I was involved in consulting projects at the time that rarely utilised creative beyond artwork (e.g. to develop an infographic or visual summary of a project output), so it wasn’t until we started seeing a shift in the types of work we could get involved in that I saw the full potential of the department. On the one hand, this was extending or augmenting existing engagement types. For example, with positioning and messaging or service design (where previously we would have ended with a strategy or CX output), now we could take things through to being fully designed, live, and in market. On the other hand, it was changing the way we thought about strategic deliverables; for example, the impact of allocating real expertise and effort to the branding of an internal change initiative, or even something as simple as a workshop. So, the early changes were in the type of work we could take on for our clients, and eventually we saw changes in how we approached all of the work we were doing. Bringing that creative approach into our strategic projects has really strengthened the impact of our delivery across the board. Thinking about how we work now compared to how we worked as a pure strategic consultancy, what would you say are the key differences in what we’re able to deliver for clients? The key difference now is that we’re able to invest in the upfront thinking behind brand development and how we communicate strategy in more resonant way. When we first brought a creative team into our processes, I think I underestimated the impact that investing in proper creative skills would have on how we could deliver things like workshops and training. Using a workshop as an example, there’s the ability to take what could be a very dry delivery and breathe life into it. Creative input from the beginning means our strategic workshop has a visual identity and core messages are emotionally resonant, getting to the heart of what we’re communicating. Specific examples would be the creation of a theme that resonates with the objective of a series of meetings and is pulled through all assets, the use of innovative formats to generate engagement, or even utilising traditional tools – we recently created a literal ‘workshop in a box’ for an innovation unit that was branded and then sent to country trainers around Europe. As some markets needed to be convinced of the value of the exercise, it was a great tool to get them excited and engaged. Investing that time in creative thinking upfront has a huge impact on what we’re able to deliver. Something that must come up when you speak to clients now, as the VP of our New York office, is how resource is distributed and how strategy, creative and account management work together. How has the transition to working with a creative team in another country been? We’ve certainly gained empathy for our clients, who are all working with teams in multiple countries and time zones. It’s given us a much better understanding of that element of their relationships within their teams, which has helped us to work better with those clients. 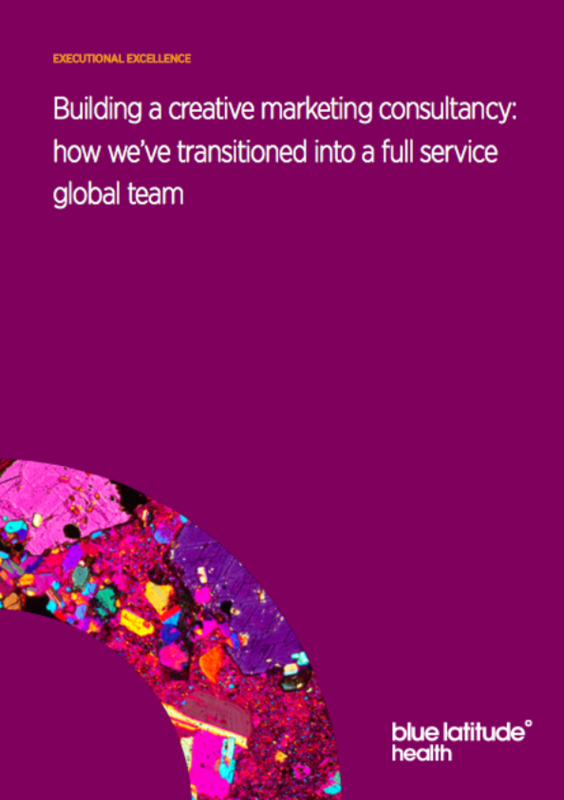 In terms of the day-to-day, we’re now operating as a global business, delivering work to clients on both sides of the Atlantic.Sometimes, that will lean more on US resource, sometimes more on UK – the critical factor is that we maintain our collaborative and integrated approach across the capabilities. This has practical implications; we’ve invested in technology so, on projects where we’ve got teams crossing both offices, we can effectively collaborate from a distance. We’re also utilising a great network of contractors in the US, which we can draw on as necessary. And, we regularly have people from the UK office over to the US, which is a great opportunity for the London teams to experience life in the NY office. While the initial focus in New York is on strategic resource, which is where we’re looking to grow our global and US offering, we’ve ensured we’ve got the right resource in the Manhattan office to be responsive and agile, while also generating efficiencies by working with our teams in the UK. As we grow, we’ll build teams here that are designed around our clients, depending on their needs, along with how we see the landscape in our sector evolving.